This villa’s outdoor space almost reminds me of a James Bond movie. The open view is sure to induce heavy daydreaming and relaxation, and the outdoor bar certainly helps! This is the perfect party villa, with space, luxury, and amenities. Castle Rock Villa overlooks Lorient Bay and is surrounded by a lush tropical garden, just a 5 minute drive from town. This three story luxury villa is perfect for your next special event or celebration. Sofas and loungers surround the infinity pool and overlook Lorient Bay, and a dining bar runs the length of a veranda. The infinity pool features an open kiddie pool area with steps, making for easy dips into the heated waters. 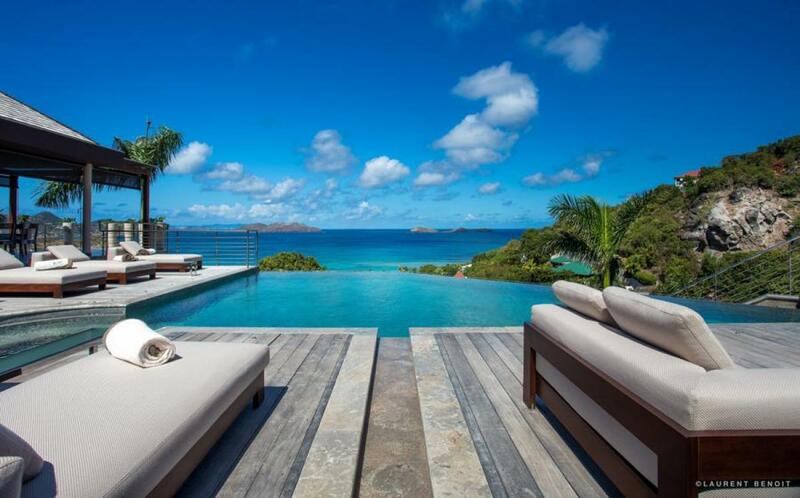 From the deck, the pool blends with the ocean for a truly unobstructed view. Sitting areas throughout the deck create an outdoor living space, and the outdoor kitchen and bar round out the exterior luxuries. Pull back the curtains, and you’ll find a warm living rooms with plush couches. Just beyond, an additional living room features a semicircle lounging sofa perfect for taking in the view. The state of the art kitchen is fully equipped, and set up like a 5-star restaurant’s. Screened sliding doors open to an al fresco dining area that seats 14, with retractable screens. The villa features multiple dining and seating areas throughout for optimal relaxation and convenience. All four suites and the fifth master bedroom are on the lower level with unobstructed panoramic views of bay. Four suites have private terraces, king beds, ensuite bathrooms, coffee stations, and flat screen TVs. The fifth master bedroom has a king bed, ensuite bathroom, flat screen TV, coffee station, and more space than the other suites. Luxurious amenities such as a Turkish steam room, fitness facilities, and spacious wine cellar take the villa to a whole other level. Breakfast and guest may choose lunch or dinner, cost of food additional.